The platform offers a highly secure provably fair guarantee across a light range of traditional casino games, as well as providing players with the opportunity to earn free coins through their generous faucet program. If you are looking for a complete and comprehensive guide on all things Crypto-Games.net, our review will tell you everything you need to know before making the plunge. We hope you found our Crypto-Games.net review useful. Every casino should have their own unique selling point and we believe Crypto-Games.net will suit the traditional gambler. They specialize in the games that matter without attempting to diversify in to areas that they are familiar with. All of their games are fully supported by a provably fair guarantee and they even have a full gambling license from Curacao. Although Crypto-Games.net do not offer any welcome packages, they do have a cryptocurrency faucet program that allows players to earn free coins. Even more impressively, they have the largest list of supported coins, facilitating deposits and withdrawals in 10 cryptocurrencies. Ultimately, if you are look for a simple, safe and secure gambling platform that will allow you to play the vast majority of classic casino games, Crypto-Games.net are ideal for you. 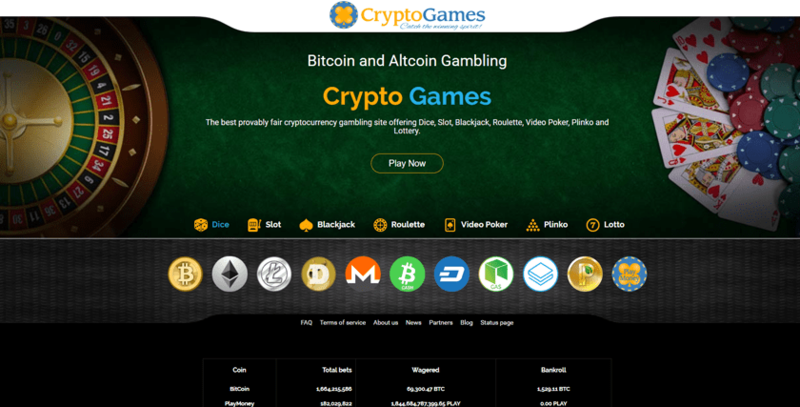 Crypto-Games.net are an online cryptocurrency casino that specialize in offering a user-friendly platform, making it a perfect avenue for both beginners and the experienced player. Based in Curacao, they were first launched in 2014 alongside their sister-platform, DogecoinMachine.net, a dedicated slot machine set-up exclusively for Dogecoin. The developers behind the Crypto-Games.net project are self-proclaimed cryptocurrency fanatics with significant experience in the IT sectors. Our Crypto-Games.net review has thus far established that the operator has a clear target market, by offering a small range of games that no matter what experience the player has, can be accessed by all. So what about their bonus policy? Unfortunately, the platform does not offer any welcome packages such as the much desired first matched deposit bonus. According to the team, they have decided to reward players by offering industry-leading house-edges, rather than giving players a one-off bonus. This means that long-term, Crypto-Games.net players have a greater chance of winning. However, the platform does has a rather unique faucet program in place, which allows players to earn free, yes free, cryptocurrency. A faucet program is a way for websites to entice new visitors to their website, which in return, they release a small amount of coins at no cost. Crypto-Games.net release new coins every three minutes and the amount that can be earned is based upon how much you are staking on their platform. Although the amounts distributed are insignificant in size, it does give you the chance to boost your betting balance. In a nutshell, Crypto-Games.net have decided to take a rather simple approach to online gambling, insofar that rather than adding hundreds of different games for the player to choose from, they offer just seven different games. As you will see from the list above, their range includes the vast majority of traditional games that you would find in a land-based casino. To break things down, their original dice game has an ultra-low house-edge at just 1% and players can choose their own odds based upon pre-defined betting parameters. Interestingly, their slot department contains just one machine available to play, however again, if you are looking for simplicity, then Crypto-Ganes.net is ideal for you. Moreover, their slot machine has a highly competitive pay-out ratio of 98.028%, ensuring that the player has a good chance of walking away a winner. We at BitBettors often get carried away by the vast quantities of games offered by crypto-casinos, however in reality, players most commonly stick to what they know – easy, fast and simple casino games such as blackjack, dice and roulette. To compliment this ease-of-access, gameplay skins are also simple, but clear to the eye. The platform also adds a social aspect to gambling, whereby players can chat to each other whilst play. As the Crypto-Games.net platform offers just seven games, there is no reliance on external software developers to facilitate their operations. This means that each and every game has been built by the team, which has allowed the developers to create a seamless gambling environment free from error. Crypto-Games.net specialize exclusively in cryptocurrency deposits and withdraws. As they have no relationship with fiat currency, you will not be able to gamble using conventional methods such as a debit/credit card or bank transfer. However, this actually affords the player a range of benefits. Firstly, when you register there is no need to provide any sensitive information. All you need to do is enter your email address (for password recovery purposed) and choose a strong password. As soon as you have done that you can fund your account with cryptocurrency. The withdrawal process is even more impressive. Our Crypto-Gaming.net review found that there were no requirements to submit documentation (such as a passport or bank statement), nor did we need to verify our identity. Instead, our withdrawal request was processed in less than as hour and the funds were received back in to our cryptocurrency wallet a few minutes after that. One of the greatest advantages to choose Crypto-Games.net is that they support a wide—range of cryptocurrencies. Whilst other more established casinos decide to focus just on Bitcoin and Ethereum, Crypto-Games.net supports a total of ten different coins, which we have listed below. In fact, in terms of choice, CryptoGames.net offers the largest range of supported cryptocurrencies in the blockchain gambling industry. The Crypto-Games.net platform does not make it clear which nations they do or don’t accept registrations from. At first glance, in-line with the anonymous nature of opening an account, we assumed that players from all jurisdictions could open an account, however upon scrawling through their terms and conditions, it appears this is not the case. The following list details the nations that are prohibited. It is important to recognise that in the terms and conditions, it states that it is the player’s responsibility to ensure that they are gambling from a territory that permits it by law. This makes sense as Crypto-Games.net promotes anonymous gambling, nor do they ask which country you are registering an account from. As a result, although we don’t recommend it, as long as you have the capacity to obscure your IP address, it remains to be seen how the platform would make judgement on where you are from. A further acknowledgement that took us by surprise was the face that Crypto-Games.net hold a full e-Gaming license from the Curacao Gaming Board. This is huge in the world of crypto-gambling, as very few operators decide to go the regulated route. However, Crypto-Games.net do not make this clear on their website. This provides the player with the comfort that they have an established gambling authority overlooking their day-to-day operations. The Curacao authorities have stringent licensing conditions that must be adhered to and if they aren’t, the board have no issues revoking it. Moreover, all seven games facilitated through the Crypto-Games.net platform are guaranteed for their fairness by a provably fair protocol. This allows the player (or any external stakeholder that wants to view the data) to independently verify that each and every gaming outcome has been determined in a random manner, in-line with the displayed house-edge percentage. As the protocol is backed-up by a cryptographic algorithm, it would be impossible for Crypto-Games.net to amend, alter and change the gaming outcome. A further security feature that we thought was highly beneficial to the player was the Google Authentic link-up. If you choose to install it (we think you should), then every time you want to log in to your account you need to confirm a code that is retrieved from your mobile phone. To complete our Crypto-Gaming.net review, we wanted to ascertain what the customer support was like. We were a bit disappointed to find out that no live chat facility was in place, as this is normally industry norm. However, when we tested out their email support, we were pleased that a customer service agent responded to us quickly. They were also very clear and concise in their response, with no generic pasted text. Moreover, there is no telephone support, so the only option you have is to send the team an email. One potential avenue to consider is to make contact through one of their social media channels, such as Facebook or Twitter. However, just make sure you don’t post any private account data on to their public page.